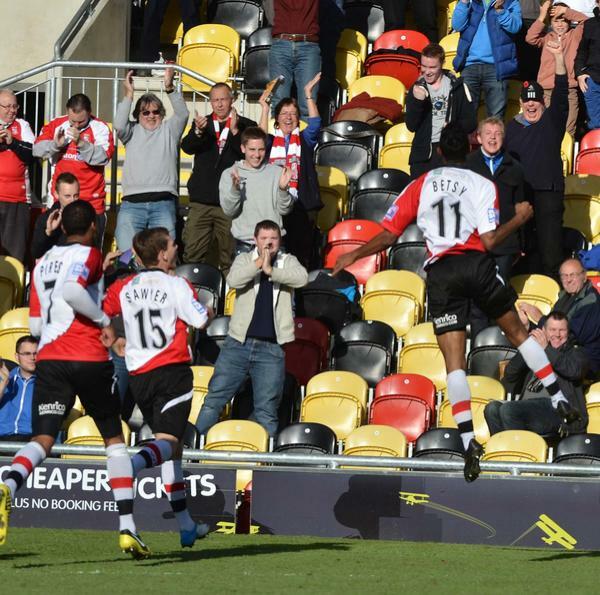 Nice One: Woking skipper Mark Ricketts congratulates Kevin Betsy after his second goal at Newport, snapped by the blogger from his corner flag vantage point. Note the ‘Mr Grumpy’ scorebox in the home end. We were doing so well, with the motorway traffic between Lancashire and the South Wales border flowing as smoothly as could be expected on a busy Saturday morning at the beginning of half term and everything going to plan. The Family Wyatt were headed for Newport County FC, about to mark my (don’t ask) birthday in style. OK, so a family room in a budget chain motel chain and a trip to see a Blue Square Bet Conference Premier clash might not be everyone’s idea of style, but there is a recession on, you know. Fact is, I know how to show my girls a good time, and we were on our way to my old stomping ground in Surrey via the delights of Monmouthshire, or in new money Gwent, as my beloved Woking FC were in town and ready to rock the current Conference leaders. An autumn afternoon at a fifth-flight football match, a night out in nearby Pontypool, a few treats in rural South Wales the next day, then a trip across the new Severn Bridge the next afternoon (the free way of course) before a trip to Granny’s. What more could they wish for a holiday weekend? It was also a bit of a first for my daughters, completing their 2012 UK tour after trips in previous months to Scotland and Northern Ireland too. I’d already conceded that my youngest might not fancy a two-hour diversion at Rodney Parade, but my other half fell on her sword and decided to schmooze around downtown Newport that afternoon instead while my eldest and I cheered on the mighty Cardinals. We had contemplated a night in Casnewydd, as the locals say, the third largest city in Wales having a few claims to being a bustling kind of place. Yet money’s too tight to mention Mick Hucknall these days, so we opted for Pontypool instead, not least as it was a cheaper option and we weren’t totally sure if Newport was the sort of city Elton John warned us about when it came to Saturday nights. Actually, I have to admit I came pretty close to booking via the interweb a night in Newport, Rhode Island, with a rival motel chain. It seemed quite a good deal and I was close to clicking on to the next page while it was still available. But once we’d forked out for new passports for all of us, flights to Boston (no, I’m not talking Lincolnshire either) and transport from there, it was going to be a dear do. And as it was we hadn’t even factored in the might of Hurricane Sandy. What was I thinking of? With relatively few obstacles on the M6 and M5 we made good progress, despite the usual slow start, yet there was a biting wind (it was hardly hurricane conditions, but it was bloody cold for the last week of October) as we set off on a walk down to the river at Ross-on-Wye, taking in the superb local scenery for my birthday picnic. There wasn’t time to do the impressive Herefordshire town itself, but it didn’t matter – we had a date with Rodney Parade. This was where it started to go wrong, leaving my bag in the back. You know the one, packed to the rafters and hiding a flimsy bit of paper detailing where we needed to head. We recalled – with my other half driving by this stage – that there was no parking at the ground itself, but how hard could it be to find? Very hard, it turned out. I already knew a fair bit about the town’s coal-exporting past – long before it received city status in 2002 – and its important part in the social history of our land, my A-level studies of Britain from 1815-1914 including knowledge of the area’s link with the pre-trade union Chartist movement and 1839 Newport Rising, the UK’s last large-scale armed insurrection. What I couldn’t remember though – having run out of time to do some proper research that previous week – was where the ground was. I knew the old one was at Somertons Park, and just assumed the new one – shared with the Newport Gwent Dragons rugby union team – was nearby, if not on the same site, which happened to be near the docks – the way we came into town. 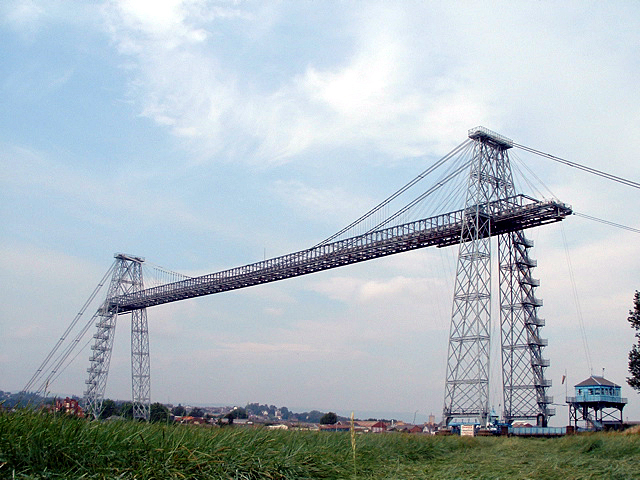 So when we saw a sign for Somerton and spotted the might of the Newport transporter bridge – dating from 1906 – I thought we were on the right lines. And when I saw a shabby-looking ground with a big advert on the side advertising Gwent Dragons I told my beloved to try the next turn-off. We did, but there seemed to be little sign of access to that ground, despite driving a couple of times around a convoluted dockside route. It was only then that I was sure this wasn’t in fact the modern home of the Ironsides, or more recently the Exiles (that should have been a major clue – I can see that now), and we headed into the city. My better half had also skipped the revision – she should never have trusted me – but did recall that the stadium was ‘just five minutes’ walk from the city centre’ according to the club website we’d (very) briefly studied. So we headed further in, with time against us by now and a late arrival likely. But – and I defy to be proven wrong here – there are bugger all signs for Newport County FC when you approach from Ross, and certainly no brown ones, and in the end it was down to three of us peering out of the window looking for floodlights while our driver negotiated an unfathomable city road network. Eventually, on the second pass and with every traffic light going against us, we were as convinced as we could be that Rodders (as we now knew the ground) was just on the other side of a half-built development across a pedestrian bridge, so when the next light turned red, my eldest and I vaulted from the car, crossed the busy thoroughfare and sprang over a mightily impressive span over the River Usk, having not seen any football likelies for some time by then. With the trusty Volvo long disappeared, thankfully our instincts were right, and I could hear a tannoy announcing the teams just beyond. 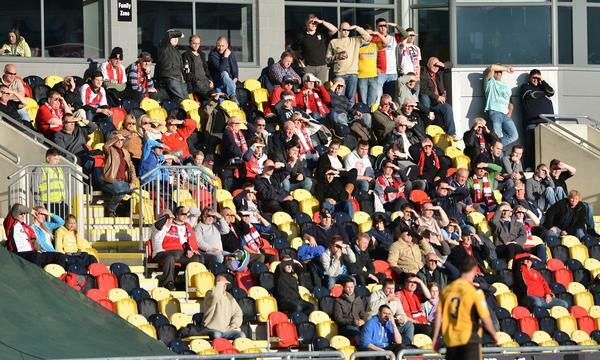 With the help of a foreign student with barely a few words of English, we then made a convoluted route around the building site to find the way in, eventually taking a seat at the bottom of a sun-drenched away stand (that biting wind nowhere to be felt) by the corner flag at the end Woking were attacking. And attack we did, taking our seat in the fourth minute, just having settled in time to see poor County defending punished by Kevin Betsy’s sixth-minute opener. 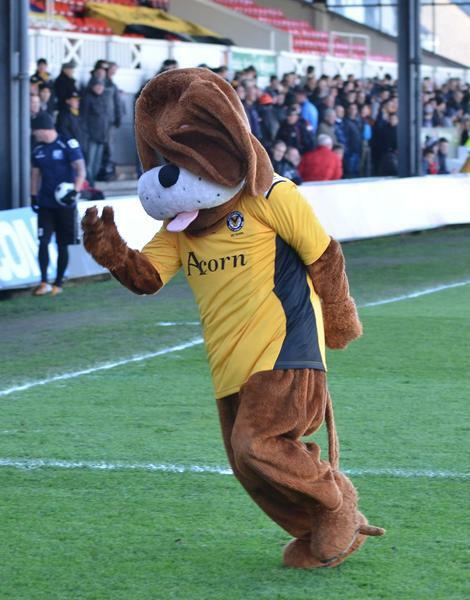 A bored steward then asked me when Newport had scored, and there were seeds of doubt for a while that we had missed a goal, but by the 15th minute Betsy had struck again and the leaders were rocking. County came back, but only showed a little of that resilience you might expect from a table-topping team managed by ex-Spurs defender Justin Edinburgh, the man with the best nickname in football (‘Musselburgh’ – geddit?). 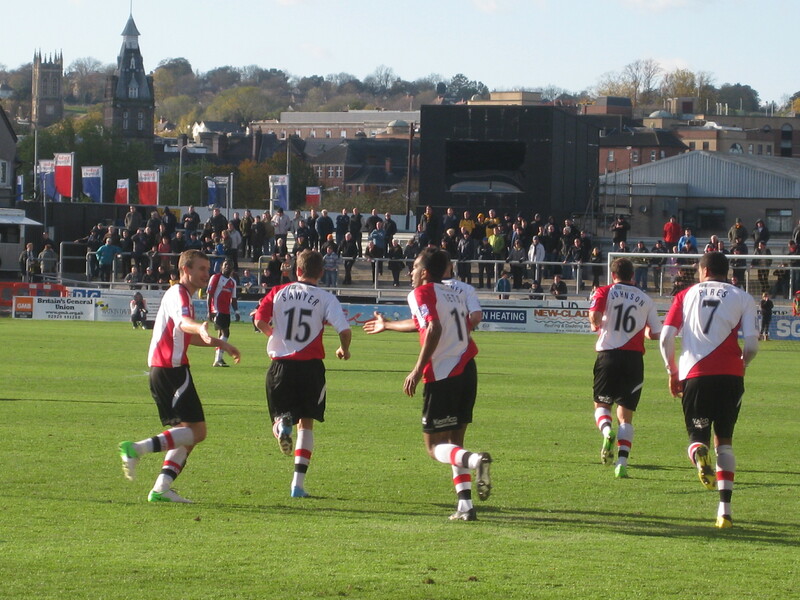 And while a stunning Andy Sandell free-kick just before the break gave home hope, Woking sub Bradley Bubb made it 3-1 on 67 minutes and despite a few late scares and a late County consolation, we hung on. On the way out, talking to a fellow Cards fan who’d let the train take the strain and crossed via the Severn tunnel from his base in Bristol, we decided to head off with him in the hope of a more direct return to the bridge over the Usk. But after a few minutes walking in the wrong direction we realised we were talking different bridges and made our way back around the ground before finding our way to the other half of the family. All further evidence of my incompetency as for as they were concerned. However, it was a triumph overall, and after a brief look around the closing-down town, with the police vans already congregating, we headed off up the A4042 to our destination, the next part of our adventure awaiting, and the recriminations over the mis-directions in full swing. But would I swap all that for satellite navigation? Certainly not. Getting lost in a strange town, to paraphrase Woking’s famous son Paul Weller, is just part of growing up and being British. And this time I didn’t miss any goals. So there’s lush, as the locals might say. This entry was posted in Football, sport and tagged Bradley Bubb, Chartists, Kevin Betsy, lancashire, Monmouthshire, Newport County, Newport Gwent Dragons, Pontypool, Surrey, Woking. Bookmark the permalink.